Oblum Leather Works is a city-based brand that makes bespoke leather shoes and accessories to meet the needs of sartorially tasteful gentlemen and ladies. If you judge a man by his shoes, a man wearing Oblum shoes would be nothing short of classy. Tarun Oblum took it upon himself to bring back the craft and art of shoe-making in the city to cater to the custom needs of shoe-loving souls. Thus Oblum floated. After experimenting with small leather goods like passport holders and card holders, the brand soon moved on to shoes. Apparently, the quality of the leather products from this brand is unmatched in the city today. From the Single Monk Strap to Wes Anderson style, this brand does shoes inspired by classic English silhouette with a contemporary outlook. 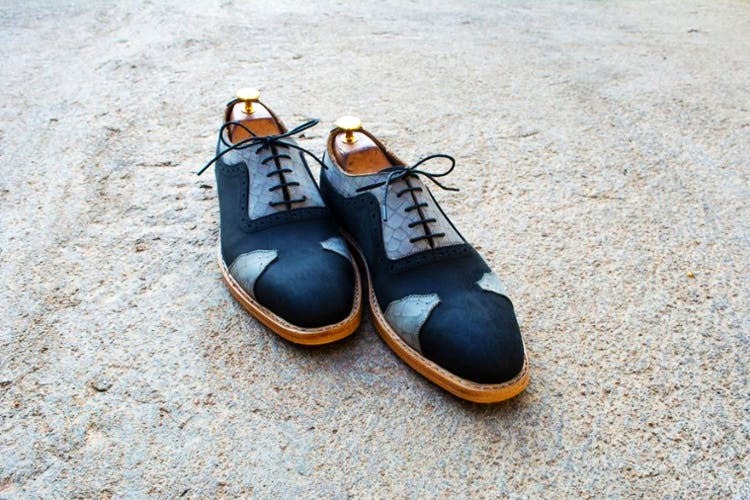 Each of their shoes is hand dyed and made with a minimal use of machinery. Be it for casual hangouts or for special occasions, you are sure to get a luxe pair of unique shoes with attention to detail from Oblum. Expect to try on your shoes within 2-3 weeks of having a detailed conversation where the brand understands your style. They make use of imported leather from Argentina, and colour the natural leather in a way that no two shoes are similar, but rather unique to its wearer. If you have a graduation ceremony, a wedding or any celebratory occasion where you’d wear a tuxedo, go for an Oxford style preferably in black or burgundy with either the tie or pocket square in the similar shade, and for more casual use, go for the single monk strap or a penny loafer. You can also hit up Oblum’s showroom (at Jxtapose) in Jubilee Hills, to find the right size and to discuss your ideas with them. If you’re not from Hyderabad, but you love their products, don’t worry because they ship internationally. So no matter what style, size or colour you’re looking for and where you are in the world, you can get it all custom made from here. The brand also makes leather accessories like wallets, camera straps, inserts for Ray-Ban, watch straps and more, so irrespective of your mood (as long as it involves fine leather)– go here for intricate, personalised work. The prices are on the expensive side falling anywhere between INR 10,000 - INR 12,000.